Another week and a bit of frequent fronts, possibly leading to a significant cold outbreak for the weekend ahead. Should be showers on each day in the south and near the ranges. Temperatures start out fairly mild, then cool to about average, before dropping further towards the end of the sequence. Could be some low level snow developing, but progs not that consistent on how cold 850Ts will get (somewhere in the -3 to -5C range). Rain totals will be quite significant about the coast and the ranges, locally above 50mm. Will be more sparse as you head into the rainshadows and the northwest. Looking at the Satellite image, tropical moisture is feeding into the westerlies to the west of Australia. This could help increase rain in the westerly fronts going forward. Still no signs of a good NW cloud band. I think the only thing that can give drought-breaking rains now is an inland cut off tapping Pacific moisture - no sign of that. Not wanting to jinx the systems but EC and GFS are cranking a big cold outbreak for the weekend. 850Ts down to -5C with lots of showers. Meanwhile a cool to mild and windy one today ahead of a fast moving front tomorrow. EC and GFs have 5-10mm for much of southern Vic tomorrow so a hand inbetween type of system. Amazing rainfall down in Tas Dave. These westerlies really crank for those areas. 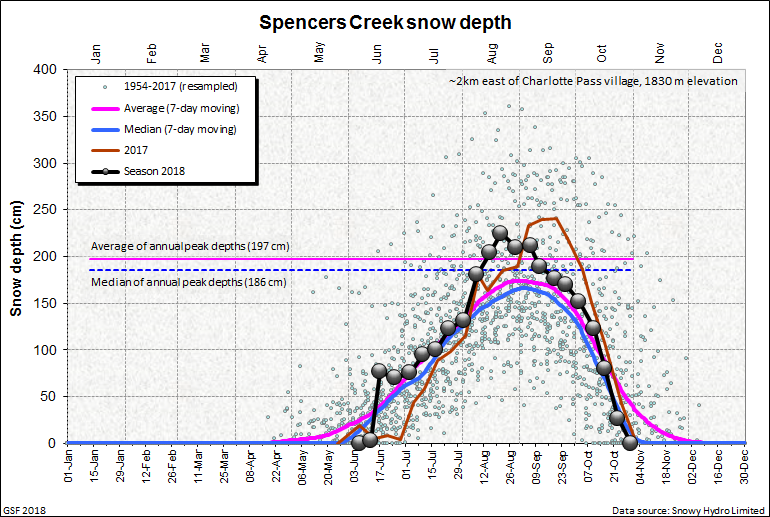 on a side topic, looks like Spencer creek is going to smash the 2m snow depth for a 2nd year running. A mini trend developing. of drying wind from the last event. taking the MTD to 130mm and YTD to 608mm on 67 days. It really is turning into a fantastic year for the resorts (see my post in the previous thread about my ski hire mate at Adaminaby). Besides overall depth, the standout feature has been consistency - even lower elevation alpine sites like Lake Mountain and Three Mile Dam in the Snowys have had an unbroken cover since mid June. A warm day today in-between cold fronts. Currently 14c and sunny. I'm not expected a whole lot of rain in the coming week here, but GFS looks really nice for a barrage of cold fronts well into next week that should give most of Southern Vic a decent drink. Cool windy one up here today. Almost felt warm in the sun, but in the shade with the wind it was chilly. Front tomorrow not looking that great now. Mostly dry in the north and in the rainshadowed south. 5-15mm in the usual wet spots in the northeast and coastal strip. @Gordon, yes incredible pics you loaded and some large falls still to come. Models as expected have downgraded and normalised. Low positioning on the weekend is changing for now, making it more a SW flow. Wont take much of a wiggle to upgrade again though. Weekend looks wet and windy, but snow levels look more like 600 to 800m rather than the 400-600m from a couple of runs back. It might wiggle back, fingers crossed. This season IMHO is close to what an average season used to me. People have "got used to" poor seasons, and when we get something approaching the long-term average or a little above its called a bumper season. Other thing about this season is the lack of low level snow. Donna Buang has been patchy at best. Lake Mt has largely relied on snow making at lower elevations. Donna Buang used to have multiple ski runs and was once slated for development as a downhill resort. You can see this on the graphs by Gerg's at link below (it's running about a week behind). People tend to forget how good Australia's snow used to be. In the Snowy's it wasn't uncommon for snow to last through the summer - my uni professor at Melbourne Uni used to monitor a semi permanent snowdrift on the side of Mt Twynam. It will be interesting to see if the Spencers Creek can reach 3m this year. That threshold used to happen one or twice a decade, but hasn't happened since the Pinatubo chilled winter of 1992. But it's not an average season by the standards of the last couple of decades HB. It is a very good season. Is it not possible to enjoy a good season without linking it to global warming? If we get snow on Sunday, can we just enjoy it without saying 'oh but we used to get that every year'? The negativity in a weather thread is unfortunate - it's almost as if every positive weather event has to be jumped on in case people 'use' it against global warming arguments. Perhaps we need a dedicated climate thread after all? I think we agree. It's a bumper by recent standards. I find it fascinating that fact can be misconstrued as negativity. One persons negativity is often another persons reality in my opinion. Last edited by Macedonian on Wed Aug 15, 2018 1:23 pm, edited 1 time in total. Windy night at home but not as windy as expected here at work. Looking forward to a wet weekend. As for a dedicated Global Warming thread I don't think it is worth going doing as the science is pretty much settled apart from the edges of the field and that is better left to the peer reviewed journals. Very strange day here, wind somewhat less than overnight, with showers forming, scudding in and dissolving again rather than in their more 'normal' organised form post-front. Feels quite spring-like, although I see snow is falling at Falls & Hotham. Btw, Vic BOM must be setting some sort of medium-term record for SWW for Damaging Winds issued this winter?